RIO DE JANEIRO/BRASILIA (Reuters) - Brazil's Petroleo Brasileiro SA cancelled a diesel price hike on Friday as President Jair Bolsonaro called for "fair" prices out of concern for truckers, spooking investors wary of political interference at the state-run oil firm. Preferred shares fell 8 percent, their biggest drop in 10 months, as the abrupt reversal raised doubts about pledges to separate politics from business at Petrobras, which sold fuel at a loss for years under pressure from previous governments. 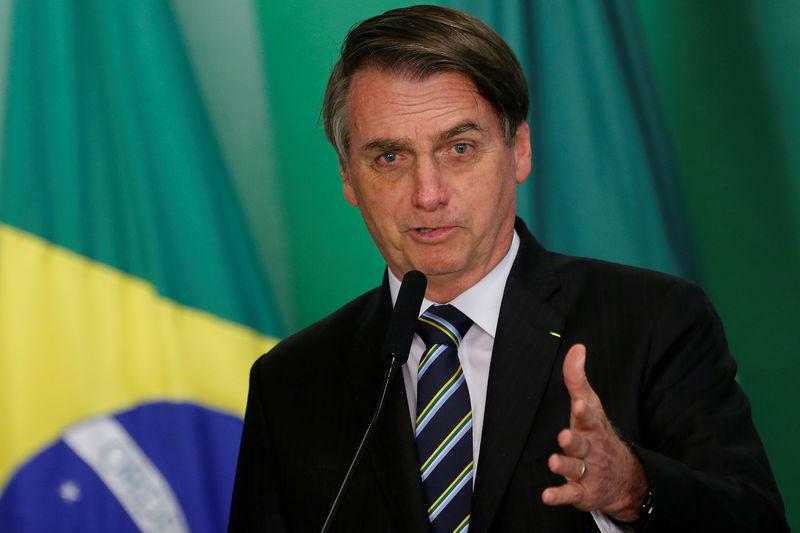 Although Bolsonaro vowed orthodox economic policies in his far-right presidential campaign last year, his first 100 days in office have raised concerns that more populist factions in his government may have an upper hand over free-market voices. In comments to journalists in the northern city of Macapa, Bolsonaro defended the move, putting further downward pressure on share prices and accelerating a slide by Brazil's currency, which slipped as much as 1 percent on his comments. "I'm not an economist. I already said I didn't understand the economy. Those who understood economics sunk Brazil, right?" Bolsonaro said, according to a recording of the exchange. "I'm also worried about cargo transport in Brazil, about the truckers ... We want a fair price for diesel." He said he would meet with Petrobras executives on Tuesday and ask them to explain why they were raising diesel prices by more than inflation projections for this year. Later on Friday, the Presidency's spokesman, General Rego Barros, said Bolsonaro, in principle, does not favour governmental interference in Petrobras. But he said the president called Petrobras asking it to cancel the hike because he was worried about the implications for the country. Petrobras announced on Thursday afternoon it would raise diesel prices by 5.7 percent to the highest level since October, effective on Friday, then disclosed it was backing off in an early-morning securities filing. Petrobras confirmed late on Friday that the government contacted the company after the hike, alerting it that the move could aggravate the truckers' situation. Petrobras said there was room to cancel the hike, considering its hedging positions. The company said it remains committed to aligning fuel prices with market prices. Bolsonaro called Petrobras Chief Executive Roberto Castello Branco late on Thursday to address the sharp price hike after discussing the matter with his chief of staff, according to a source in the presidential palace. Last year, a huge truckers strike over high diesel prices paralysed much of Brazil and led the government to intervene in Petrobras' pricing policy. Then-CEO Pedro Parente quit in protest and the company's share price nearly halved in a month. Petrobras updated its diesel pricing policy last month, saying prices would not be readjusted more than once every 15 days and reaffirming it would not price the fuel below parity with international markets. "It's a shame because all that's been said by the government up to now is that you're going to have prices tied to international prices, and Petrobras is going to have independence when it comes to pricing policy," said Adriano Pires, a consultant at Brazil's Center for Infrastructure. He added that the move could complicate Petrobras' plans to sell two groups of refineries over fears the government might intervene in refinery fuel pricing. That sale would raise several billion dollars if successful. Analysts at UBS led by Luiz Carvalho pointed to a March announcement that Petrobras would take part in a gas tender in Israel, an ally of the Bolsonaro government, as evidence that the price hike reversal is likely part of a larger trend of government interference at the firm. Petrobras said in the Friday filing its current hedge position allowed it to delay a price revision for "some days," without detailing its plans for a future readjustment. Although Bolsonaro has decried the economic mismanagement of his predecessors and vowed to follow the lead of his market-friendly Economy Minister Paulo Guedes, he is a late convert to free-market ideas and was an early backer of the 2018 trucker strike. The reversal was stirring concerns that Petrobras could again be forced to foot the bill for cheaper fuel in the Brazilian market, according to a person close to the company. "Bolsonaro is engaged in exactly the same dangerous populism as Dilma (Rousseff)," said the source, referring to the former leftist president who served from 2011 to 2016. "If you want to question the policy, then do that through the board of directors. But price decisions are made by the management, not the president of the republic." Bolsonaro installed Castello Branco as CEO at Petrobras after his January inauguration, with a mandate to extend asset sales and focus on the core activities of offshore oil exploration and production.